The GM-X Content subsystem maintains rich content in the GM-X database, together with related files such as PDF documents, images, computer-aided design (CAD), spreadsheet, word and media files. The resulting content may be acessed dynamically by a front-end Web site, such as an online store, instead of being hard-coded into HTML documents. Alternatively, the content may be accessed by other GM-X subsystems. For example, the GM-X Request subsystem can access the Content subsystem to retrieve and display, in a supplier portal, items such as PDF documents and CAD files related to a request for quotation (RFQ) or purchase order. 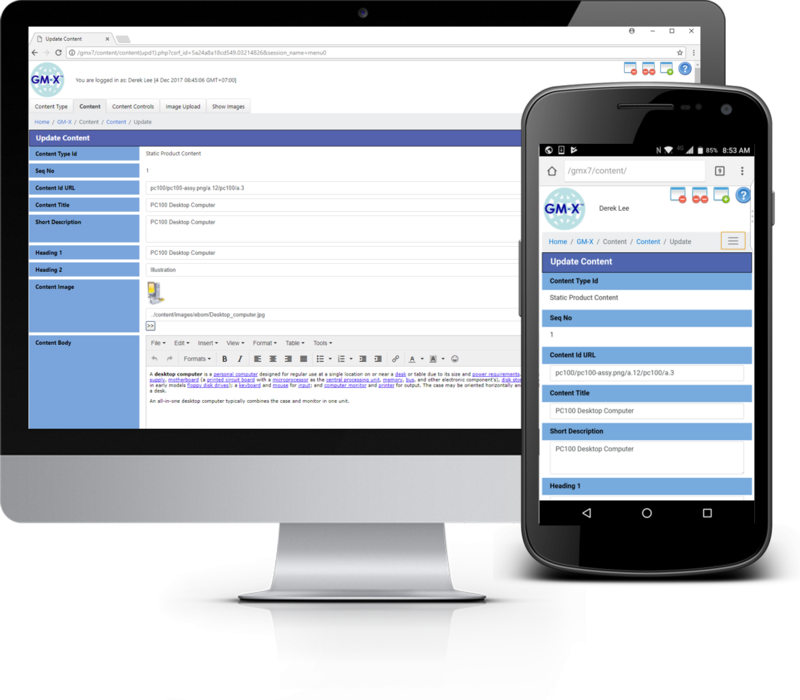 When used in conjunction with front-end Web sites, such as online stores, the GM-X Content subsystem provides a single content repository to streamline the sharing of information in real time between one or more front-end Web sites, and the GM-X application which can serve as a back office system, customer portal or supplier portal. This eliminates the complexity of replicating the same information between multiple Web sites. Integrating GM-X and the front-end Web sites is typically done using Web services such as XML-RPC or SOAP.